What can reduce carbon emissions, create 2 million new U.S. jobs, and pay a dividend to every American household? 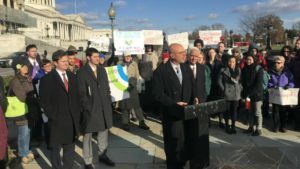 The Energy Innovation and Carbon Dividend Act was initially introduce to Congress in November 2018, and re-introduced in January of this year. 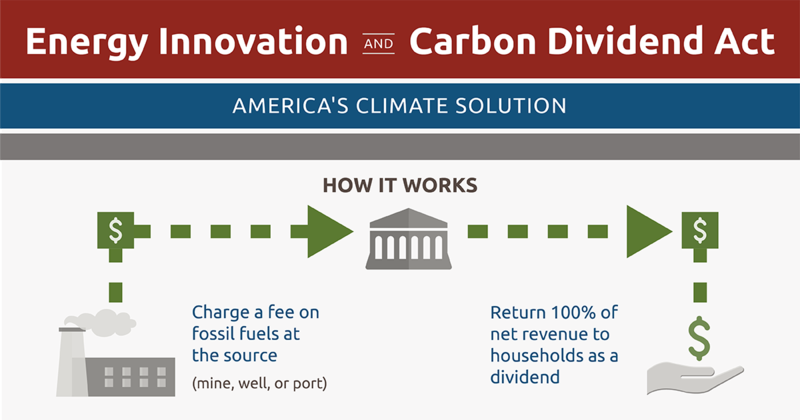 What is the Energy Innovation and Carbon Dividend Act? The Energy Innovation and Carbon Dividend Act – H.R. 763 – creates “a fee on carbon-emitting fuels, like coal, oil or gas, assessed at the mine, the well, or the port of entry.” This is NOT a tax. All fees collected will be deposited into a Carbon Dividend Trust Fund, with 100% of the net revenues paid as dividends to every U.S. household. Under this plan, fees and dividends will start small, with fees in the first year “at $15 per metric ton of CO2-equivalent GHG emissions, and rises steadily at $10 per ton each year” with dividends expected to be around $500 per person. The idea of U.S. citizens receiving an annual dividend from the oil & gas industry is not new. And the nearly 40-year history of the Alaska Permanent Fund Dividend supports the contention that HR 763 will also stimulate local economies. On November 27, 2018, the Energy Innovation and Carbon Dividend Act became the first bipartisan carbon tax bill to be introduced in the U.S. House of Representatives. When it was introduced in the Senate three weeks later, it became the first bipartisan carbon tax bill to be active in both houses of the U.S. Congress. With a new Congress just sworn in, it was reintroduced in the House of Representatives on January 24, as H.R. 763. In the past two weeks, four more Representatives have signed on as co-sponsors: Alcee Hastings (D-FL-20), Salud Carbajal (D-CA-24), Henry Johnson (D-GA-4), and Dean Phillips (D-MN-3). It’s time to spread the word. Let’s put a #priceonpollution and support H.R. 763, the Energy Innovation and Carbon Dividend Act.